Reigning Alabama TDC champ Mark Knight (center) spearheads the team heading to Nationals this week. Above, he poses with ATA Chariman of the Board Terry Kilpatrick of Billy Barnes Enterprises (left) and ATA Safety Council Chairman Tony Smith of AAA Cooper Transportation (right). This week the Alabama Trucking Association sends one of its most experienced team of drivers yet to the American Trucking Associations’ National Truck Driving Championships & National Step Van Driving Championships in Columbus, Ohio. 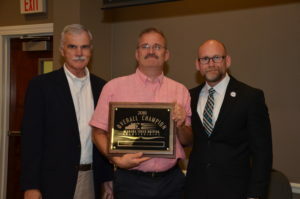 Spearheaded by 2018 Alabama TDC Grand Champion and five axle competitor Mark Knight, the team includes Robert Moore of FedEx Freight, step van class; Kenneth Lockhart of FedEx Freight, tank class; Russell Cottingham of FedEx Freight, sleeper berth; Dan Thompson of FedEx Freight, twins class; Thomas “Ross” Garner of FedEx Freight, flatbed class; Charlie Salter of FedEx Freight, four axle class; Al Lewis of YRC Freight, three axle class; and David Hawk of FedEx Freight, straight truck. Our teams have had success at the National TDC competition before, but it’s not easy to win there, and according to ATA Director of Safety Tim Frazier that’s because the National competition is a far bigger stage with more competitors (usually 50 drivers per class), more distractions, and a lot more on the line. The 2018 National Truck Driving Championships & National Step Van Driving Championships happen August 15-18, 2018 at the Columbus Convention Center with more than 430 of best-of-the-best professional drivers will compete. For more information, visit www.trucking.org.